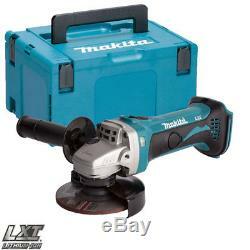 Makita DGA452Z 18V LXT Li-ion 115mm Cordless Angle Grinder Body With Makpac Case. Makita built produces 50% faster grinding with an impressive 10,000 RPM. More compact design at only 12-1/2 long and weighs only 5.6 lbs. Ergonomic shape fits like a glove with even pressure and easy control. LXT Lithium-Ion provides longer run time, 5x lower self-discharge (for use any time) and 16 firm holding contact terminals (for constant high power). Built-in electronic control circuit with L. Warning lights for overload protection. Powerful angle grinder now free from the restriction of cables and power sockets. Capable of using wheels or discs for mains grinders. Easy-to-grip, small circumference motor housing. Grinding Wheel: 4-1/2 / 115mm. Wire Cup Brush: 3-1/2 / 115mm. Sanding Disc: 4-1/2 / 115mm. No Load RPM: 10,000. Spindle Thread: 5/8 - 11 UNC. 1 x 821551-8 Mak Case Type 3. 1 x Makita Case Insert Tray 837632-8. Additional charges wil be imposed if, weight is more than1 kg. Postcodes Details are Given Below. HS 1-9, I 1-56, KA27-28, KW1-17, PA20-49, PA62-77, PA60-61, PA78, PH17-26, PH-30-44, PH49-50, ZE1-3, BT1-94, IM1-9, IM99, TR21-25, Isle Of Wight. If, you receive any Parcel from us that contains damaged goods, this should be notified to customer services who will arrange for collection and replacement, within the 24-48 hours period. The item "Makita DGA452Z 18v 4.5 115mm Angle Grinder Lithium Ion Bare Unit + Makpac Case" is in sale since Friday, December 7, 2018. This item is in the category "Home, Furniture & DIY\DIY Tools & Workshop Equipment\Power Tools\Grinders". The seller is "tools4trade" and is located in Milton Keynes. This item can be shipped to United Kingdom.